2) the actress Martha Hyer. Career: Left school at 14, and worked as office boy and salesman for electric heating company; 1922—manager of Garrick film theatre, Los Angeles; 1923—joined Warner Bros. as assistant to head of publicity, then became head of publicity; 1928—made studio manager; 1928–31—production executive 1933–42—executive producer in charge of production; 1942—formed Hal Wallis Productions, releasing through Paramount and, after 1969, through Universal. Awards: Irving G. Thalberg Award, 1938, 1943; Academy Award for Casablanca , 1943. Died: In Rancho Mirage, California, 5 October 1986. Today's Cinema , 18 August 1969. Films and Filming (London), December 1969. Mancia, Adrienne, editor, Hal Wallis, Film Producer , New York, 1970. Kine Weekly (London), 20 September 1969. "Wallis Issue" of Dialogue on Film (Beverly Hills, California), March 1975. Obituary in Variety (New York), 15 October 1986. Obituary in Films and Filming (London), December 1986. Obituary in Sight and Sound (London), Winter 1986–87. Film Comment (New York), July-August 1989. Corliss, Richard, "14-Karat Oomph," in Film Comment (New York), July-August 1989. Woodcock, J.M., "The Name Dropper," in American Cinemeditor (Encino), no. 1, 1990. Edwards, Anne, "Hal Wallis: The Producer's Valley Farm," in Architectural Digest (Los Angeles), April 1992. Dolven, F., "Hal B. Wallis: The golden-arm producer," in Classic Images , no. 220, October 1993. Hal B.Wallis was one of the most important movie producers from the Golden Age of Hollywood filmmaking of the 1930s and 1940s. 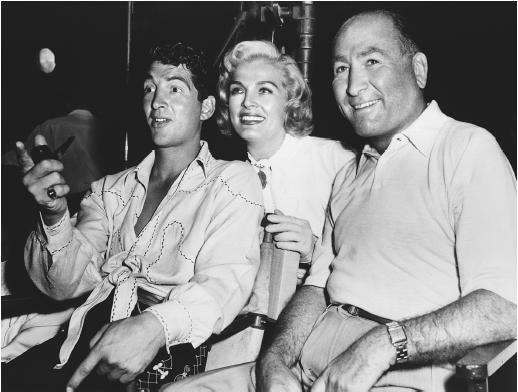 On one classic Warner Bros. movie after another Hal B.Wallis' name is listed under the title: Warner's studio boss, Jack L. Warner, was the brother in charge of the west coast studio, but surely his right-hand man, Hal Wallis, did most of the day to day work producing. In the 1930s Wallis produced many of the classic genre films. Little Caesar, 'G' Men , and The Roaring Twenties defined the gangster form. There were few more honored films of the decade than I Am a Fugitive from the Chain Gang, Anthony Adverse , and Jezebel. Gold Diggers of 1933, Footlight Parade, 42nd Street , and Gold Diggers in Paris swung with music and dance. Captain Blood, The Charge of the Light Brigade , and The Adventures of Robin Hood defined what an adventure film should be. Although film scholars have traditionally associated Wallis with his classic Warner period of the 1930s, he reached his creative peak at the studio in the early 1940s. Wallis produced a remarkable string of classic films: Sergeant York, The Maltese Falcon, High Sierra, The Bride Came C.O.D., The Strawberry Blond, Now, Voyager, Yankee Doodle Dandy , and Casablanca. But Wallis' career was hardly over when he left Warner Bros. in 1944. He would remain a key force in the Hollywood film industry until 1975, when he produced his final film, Rooster Cogburn , starring John Wayne in a sequel to yet another Wallis hit, the 1969 True Grit. In 1944 Wallis sought greater independence as a producer. Understandably he chaffed under the yoke provided by Jack L. Warner. He weighed several offers and went with Paramount. At Paramount Wallis' career fell into four phases. In the first he continued producing genre films, in this case thrillers in the late 1940s and westerns during the early 1950s. But his career changed dramatically in 1956 with the release of Artists and Models , setting in motion a string of Jerry Lewis and Dean Martin comedies. A third phase began in 1958 when Wallis began producing the predictable, but high-grossing films starring Elvis Presley. Few find these Elvis formula movies complex or sophisticated cinema, but they made money, lots of money. Indeed Blue Hawaii finished as the eleventh highest grossing film of all of 1962 according to Variety 's figures. Wallis' final period of filmmaking followed Elvis and lasted from 1964 to 1975. He is probably best remembered for making two very different types of films in this period. The first were westerns starring John Wayne including the aforementioned True Grit and Rooster Cogburn , as well as The Sons of Katie Elder. Far different were the tales of royalty, costume dramas which Wallis called in his autobiography his "royal histories." These included the very successful Becket, Anne of a Thousand Days , and Mary, Queen of Scots. Wallis was a consummate producer, taking project after project that both interested him and seemed destined to make a great deal of money. He skillfully flowed with the times, and in the process helped several major eras of Hollywood history. In nearly a half century he produced, coproduced, and/or supervised more than 400 films. Few individuals have been as successful as Hollywood producers; few have made a greater stamp in defining how Hollywood operated as a business.